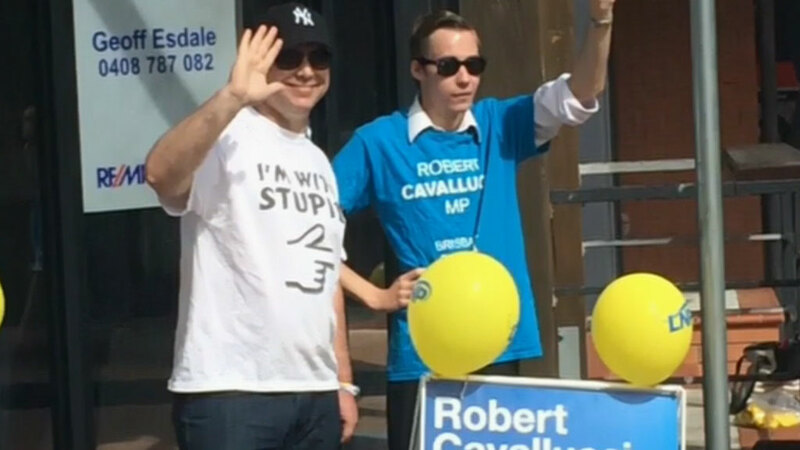 Australian police keep the public safe by arresting man wearing ‘I’m with stupid’ T-shirt among LNP campaigners. In life, everything is about proportion. 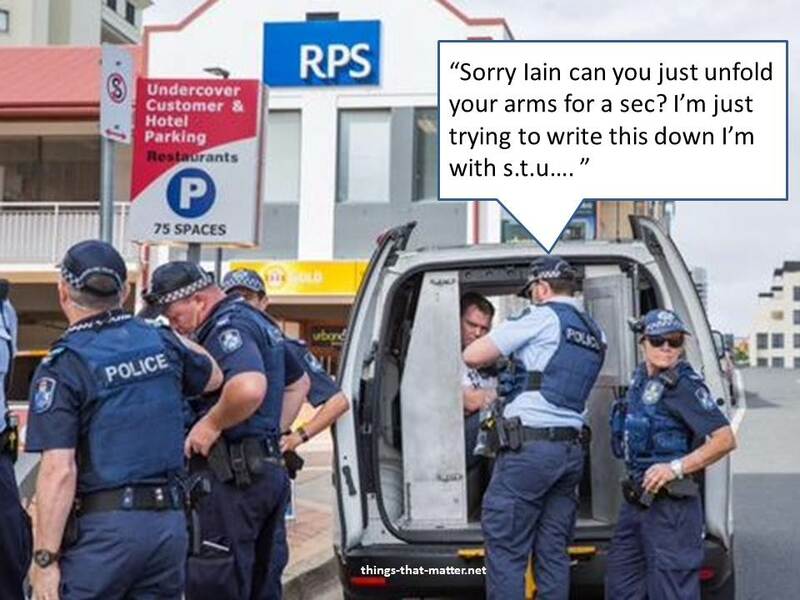 One thing police forces around the world seem to be struggling with right now is finding the proportionate response to the problems they have to deal with, such as the situation of the lucky lad we covered previously who was forcibly removed from a plane travelling from Gold Coast to Melbourne for his terrorist doodles. 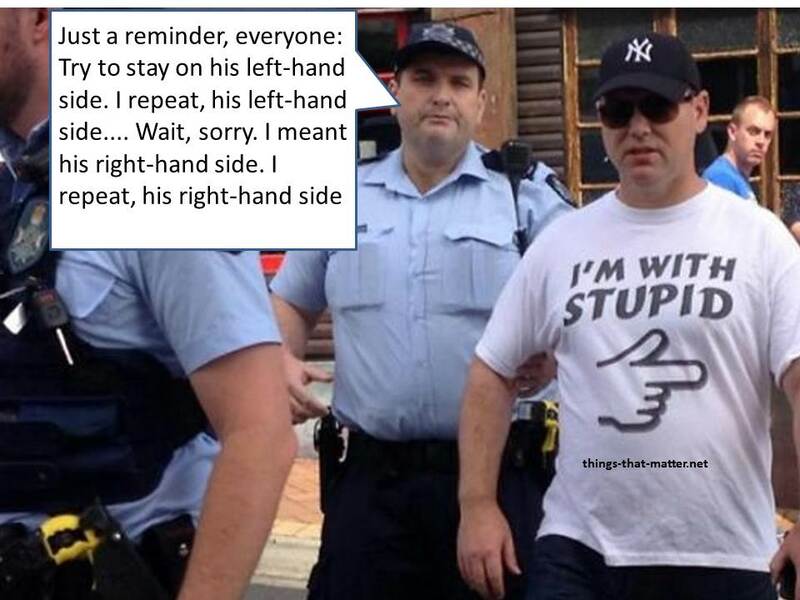 Again in Australia we witnessed another inane and feeble-minded use of law enforcement when Brisbane police arrested Iain Fogerty ,of New Farm who wore a t-shirt imprinted with “I’m with stupid” and a finger pointing to his left. As the Queensland state election campaign kicked off, he positioned himself next to various NLP supporters, supposedly garnering a few laughs in what is normally the boring and predictable theatre of “my colour is better than your colour” that all these elections end up amounting to. Given the glib nature of how political campaigns are run, and the smorgasbord of morons that currently control the Queensland government, let’s face it, he was the only person there that day reporting the truth. Getting complaints about a “public nuisance” on the loose, we had a crack squad of 10 armed police officers skilfully swarming down on the “public nuisance,” effectively shutting down his shenanigans pronto. Maybe someone had over-rostered too many police officers on that day and they were just bored. Yet taxpayers bear the cost for these 10 brainiacs to waste their time, process the paperwork, and occupy future court dates, all for something that could be solved with a simple, “Move along buddy, or we will book you.” The irony seemed to be lost on the 10 officers as they huddled around Mr. Fogerty as if they were attending something important, as the “I’m with stupid” finger went from aptly pointing to the NLP campaigners to pointing at the 10 idiot officers who went ahead and arrested him. 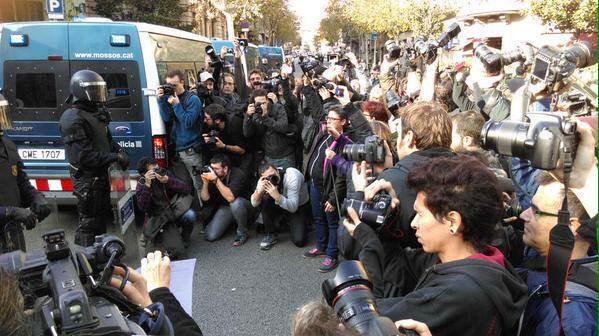 What’s more disturbing about this is what it says about our freedom of speech and our right to protest. Have we turned the annoying of annoying people into a crime? What’s next? If NLP supporters are in public flaunting their political beliefs for all to see, why shouldn’t we be able to do the same? If I am going about my day and am accosted by birdbrain NLP fans trying to hand me party propaganda, which talks about a truthful “witness” magazine, then why can’t I call the police and report the NLP supporters as a public nuisance? If I am rightly the “public” and I find them a “nuisance” then why wouldn’t all of them get arrested? Why stop there? Here I am enjoying a bit of satire as this guy with the “I’m with stupid“ t-shirt is pointing out the obvious, and suddenly 10 police officers turn up and take away my the public mirth. Can I get those 10 officers arrested for being a public nuisance?